Appearance (0-20): Beautiful looking wrapper. The CSL has a gorgeous dark tone to it with a band that pops out at you – red and gold on a white background. The design and look was nothing overboard, nothing too simple – just perfect. There was some nice aging on the cigar, and it seemed to be wrapped nearly perfectly. If you looked closely at the CSL you could see a few small veins, but nothing intrusive by any means. Construction (0-20): The CSL had a firm construction that I have grown accustomed to with the Cain lines. I couldn’t find anyplace that there were pockets of misplaced tobacco, and post cutting it seemed to stay very compact. There was decent resistance on the draw, but nothing that would be a cause for concern. Upon lighting it stayed consistent, holding together well throughout the entirety of the smoke. Strength (0-20): Finally, I have found a cigar that was billed as full bodied that actually came through with a full punch in the face. No pulled punches here. But I guess that’s exactly that you would expect from something that is billed as straight ligero - very strong. This was my second cigar of the night, so perhaps I was a little weakened, but it definitely hit nice and hard. Flavor (0-20):.Cocoa and chocolate are two of the flavors that are striking immediately upon lighting up the cigar, which is made that more pleasurable when paired with some underlying earthy tones. There are some other slight spices that I couldn’t pick up on fully, but it simply was an addition to the experience. It seemed there was a bit of complexity that was sacrificed in order to give it the extra kick of strength. Value (0-20): I can’t quite complain about this being an $8.00 stick. It’s got a very good flavor, some real power behind it, and is extremely consistent. However I can say I would have liked more complexity… all in all, its likely around the right price. Additional Notes: Paired with Sam Adams Holiday Porter at Cigars International. Overall (0-100): If given the chance I would smoke this one again. A nice flavor is complimented by a few slaps in the face in the strength department. The price variable isn’t a huge one, but obviously could be a deciding factor depending on how deep your pockets are (or how many cigars you smoke!). The only bummer, to me, is a lack of complexity during the smoke. 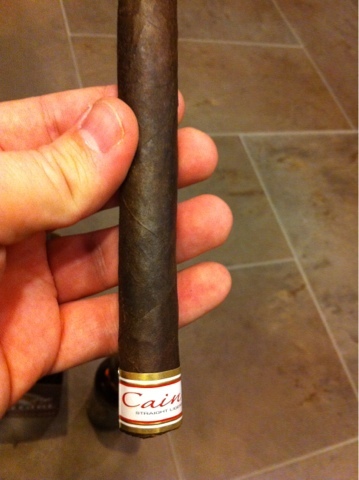 The Cain Straight Ligero, however, is perfect for those who want a consistent, full bodied smoke. Alec Bradley Black Market Review - DUAL BROSKIES! Tatuaje Wolfman Review - Dual Broskies!